Alexa Voice Service (AVS) is the software that allows owners to control compatible devices with their voice. From the various reports it was estimated there were 700–1,100 Alexa-controllable products at CES. And the Amazon / Alexa logo was everywhere at CES. The Amazon Echo is a hands-free speaker controlled with your voice. It connects to the Alexa Voice Service to provide information, news, play music, report on sports scores, deliver weather reports… The uses for AVS and Alexa are limited only by your imagination. When something is connected to Alexa, the device instantly becomes pseudo-interoperable. Interoperable technology is not an evolutionarily stable strategy for most IoT manufacturers. Interoperability is the ability of different information technology systems and software applications to communicate, exchange data, and use the information that has been exchanged to do something. What CES showed us is that voice control seems to be the unifying app for IoT. And Alexa is the biggest name in voice control. Smart devices are generally controlled with apps. If there is an app to control the smart device, the app allows AVS to directly control the smart device. So you could say, “Alexa, tell Crestron I’d like to turn the lights on in the bedroom” (for your Crestron) or “Alexa, I would like to turn the heat on the downstairs thermostat to 70 degrees” (for your Iris Smart Home System). It’s easy to see the value of voice control in so many ordinary situations. What’s interesting about AVS is that even though Crestron and Iris have nothing to do with one another, you can control them both with your voice. Alexa has finely tuned automatic speech recognition (ASR) and natural language understanding (NLU) engines that recognize and respond to voice requests instantly. Alexa is always getting smarter with new capabilities and services through machine learning, regular API updates, feature launches, and custom skills from the Alexa Skills Kit (ASK.) The AVS API is a programming language agnostic service that makes it easy to integrate Alexa into your devices, services, and applications. And it’s free. And you can create meaningful user experiences for an endless variety of use cases with Alexa Voice Service (AVS); Amazon’s intelligent voice recognition and natural language understanding service. AVS includes a full range of features, including smart home control, streaming music content, news, timers… and can be added to any connected device that has a microphone and speaker. But while Alexa has a head start, Google Home, an Echo competitor, is very likely to quickly catch up. Google Home though, works with a completely different set of protocols and has different “awake” words. These are command words that make it pay attention and carry out the request. It seems that we may need to learn to speak to different systems in different ways – perhaps we’ll need lessons in Alexa speak and Google speak as well as and Siri and Cortana speak! So is the Age of George Jetson here yet? Sort of. What will be interesting is to see if there is a start-up that will pull all of this together so that us regular humans don’t need to become AI experts to connect and use the technology. 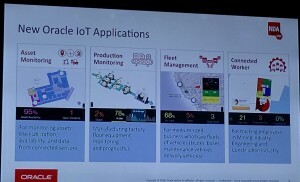 #OOW16 – #IOT Is Really Asking Your Business What Outcomes Are You Looking For? Central Service– which drives self-service as well as self-guided service. Connected worker for the tracking of employees, for instance in the mining, engineering construction industries. VINCI is building the next generation sensor-driven building automation to reduce the number of “truck rolls” which has a huge ROI. 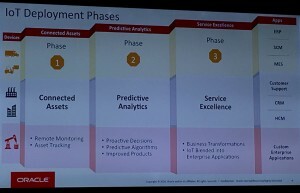 They are doing this with the integration or Oracle Service Cloud and SAP. Lochbridge is creating connected fleets where IOT and big data is being used for predictive maintenance in monitoring fleet / cargo to reduce the response time. GEMU is using real-time filtering and processing of valve events and proactive parts replacement with the integration of CRM, IOT and a service ticketing system. 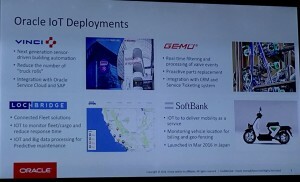 And SoftBank is using IOT to deliver mobility-as-a-service where they are monitoring vehicle location for billing and geo-fencing. As the world of IOT expands and more and more companies start to see the value in connecting enterprise applications, with devices, and networks, we will see the transformation of workers, employees and customer experiences. 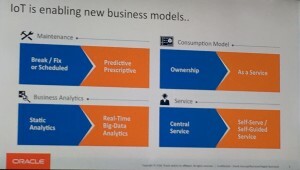 When those experiences are transformed, the real value and ROI of the connected enterprise will come to life. Where I am Speaking This Fall! Come Say Hello! There’s been a lot of talk around self-driving cars and Local Motors, a leading vehicle technology integrator and creator of the world’s first 3D-printed cars, introduced the first self-driving vehicle to integrate the advanced cognitive computing capabilities of IBM Watson. Local Motors is a technology company that designs, builds and sells vehicles. The Local Motors platform is a combination of a global co-creation with local micro-manufacturing to bring hardware innovations quickly to market. Local Motors in National Harbor, Maryland is a public place where co-creation is the focus for advancement of vehicle technologies. What can you see if you visit the Maryland facility? On display are 3D-printed cars and a large-scale 3D printer. There visitors can have an interactive co-creative experience that showcases what the future of 3D printing, sustainability, autonomous technology will be. Visitors can get involved with Local Motors engineers and the company’s co-creation community. In addition, Olli can make recommendations on local restaurants or historical sites. Olli is essentially designed to deliver interesting, entertaining, intuitive and interactive experiences for riders. How is IBM Watson is being used to improve the passenger experience? It is enabling the natural interaction with the vehicle via the cloud-based cognitive computing capability of IBM Watson IoT to analyze and learn from high volumes of transportation data produced by more than 30 sensors embedded throughout the vehicle. As the vehicle gets used, Local Motors plans to install more sensors and adjust them continuously as passenger needs and local preferences are identified. Having worked in the automotive industry in Detroit, it’s exciting to see new develops like this. It’s also exciting to see the application of cognitive computing in a real world situation. Using it for something like empowering self-driving vehicle is probably the best way to advance not only the self-driving cars but also the ability to deploy cognitive computing in a real world application. This looks to be the start of something very interesting that other brands in this space should be taking note of. Competition in the automotive is rapidly changing, from the provision of Cars-As-A-Service, with GM investing $500M in Lyft to cars that drive themselves. The Future is here. Covering customer-facing applications that create amazing customer experiences. Sports is the new playing field is the world of business. Real Madrid is one of the most storied futbol clubs in history. Over 113 years, the club has won 116 official trophies. FIFA has recognized Real Madrid as the best futbol club of the 20th century. Since then, they’ve won the Champions League 10 times as well as the European Cup. And fans of the Real Madrid futbol club are some of the most passionate and loyal in all of sport. These fans, 450 million of them, are spread around the world. In fact there are more Real Madrid fans in Indonesia and the U.S. than in Spain. And more than 120 million are connected through the digital ecosystem, following the club on social networks. Soon, they will have even more ways to connect with their beloved team on and off the pitch. Microsoft and Real Madrid are working together to revolutionize the club, and the futbol experience, through technology. This four-year vision will change the way people engage with the game, while enabling fans to have a unique two-way conversation with the team. A digital platform, built on Microsoft Azure, will give supporters of Real Madrid access to content and exclusive digital services at the stadium, at home or on the go. The app provides access to these experiences on phones, tablets and wearable devices, while connecting the Real Madrid faithful to the virtual pitch before, during and after the game. Jose Angel Sanchez, the club’s chief executive officer, sees the team’s digital transformation as the next step to embracing the fans of the future. He explains that the club belongs to the people — the cloud gives the club the opportunity to connect with fans in a personalized way. Here’s a video. What is Microsoft up to now? Empowering people with sight loss the opportunity to experience city life. Everyone has a right to independence, but not everyone has the capacity. Cities Unlocked aims to set people with sight loss free to experience city life like never before. The pilot program is a unique collaboration between Microsoft, the U.K. charity Guide Dogs, and urban innovator Future Cities Catapult as well as other partners from business and academia. Even local travel is difficult and daunting with vision loss, which could be part of why of the two million people in the U.K. who have registered their visual impairment, 180,000 rarely if ever go outside, according to Guide Dogs. In the U.S., about 65 percent of people with vision loss are unemployed. The partners worked together to create a prototype headset and mobile app that works with Bluetooth beacons placed along a given route to provide audio turn-by-turn directions, nearby points of interest (“Chiropractor, about 10 meters”), transportation updates (“No. 9 bus is approaching”) and even polite warnings (“Be aware: This is a main road”). A flexible, robust foundation provided by Avaya Aura® and Elite contact center solutions, which continues to lead the industry now as a 100% virtualized, 100% software-based platform that eliminates the need for hardware-based media gateways to perform important call center functions. Software-defined customer engagement that makes it possible to communication-enable sales and service workflows and processes through Avaya Breeze which can significantly enhance the customers’ experience. A full stack, turnkey solution in Avaya Pod Fx (formerly Collaboration Pod), providing everything needed to run an advanced virtualized contact center (applications compute, storage, networking & management) all racked, stacked, cabled and configured to remove complexity and streamline operations. Maximum evolution flexibility through the new Avaya Secure Delivery offer which provides hosted private cloud communications for security conscious organizations (US). What Are the benefits of Avaya’s Approach? Customer defined experiences for all channels and devices – traditional voice, web & mobile chat, social, email, WebRTC-enabled, one-click mobile video and calling from any device, guided co-browsing and advanced customer service applications that simply snap-in without massive technical support. 360 degree customer context that makes it easy to map customer journeys across automated and assisted service channels. Minimized effort on behalf of the customer or business to obtain or deliver optimal service by combining analytics and automation. The ability to easily design workflows to create smart customer journeys that easily tap into enterprise CRM systems and bring other data into a single business process. Unparalleled flexibility and scale for today’s multi-modal environments that allow companies to easily adjust to changing demands. Simplified transition to new technology and refocus on core business advancing projects by leveraging a more secure, hosted cloud based delivery. Customer choice of deployment options, including public, private or hybrid cloud, premises-based and managed services to match business policies and objectives. What’s Your CEO Going to Do About Customer Service? Is your company ready for the next generation of customer experiences? Customers are more fickle than ever. Who can blame them? Customer Service has not been an important aspect of many brands initiatives – at least they didn’t want to put the money behind it… so it did not met customers expectations. With customer expectations rising even fast in this always-on world, companies need their CEOs to get the message and support customer service. Does your CEO get customer service yet?